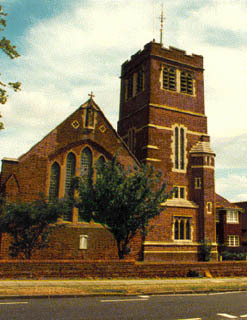 I used to go to the Church Youth Club around 1972 – 73. I cannot remember much about what we got up to, apart from a memorable performance by a band called ’57 Chevy which comprised the late Csaba Kerekes, his brother Zsolt, Ed Bryant and possibly Ric Britt on drums. I wonder if anyone else remembers those times? As a teenager in the 1940’s, I lived near Preston Park railway station and my church was Clermont. But I can well remember attending the dances which were held in the church hall at the Good Shepherd Church. So typical of those days when most boys were rather shy and pretty awful dancers. I recall that the girls all seemed to sit one side of the hall and the boys on the other side, trying to summon up the courage to ask a girl for a dance. I don’t remember much about who provided the music, but I do smile when I look back at those church hall dances which were so typical of those days. When visiting Brighton recently, we were told of an area in Preston Park that was designed for blind persons. We went to the park – one person sent us in one direction, another somewhere else. After a lot of walking, up and down the park we gave up. Why is such an area not signposted as nobody is sure where it actually is? Jo, I remember Csaba and his brother. I was in the same class with Csaba at Cardinal Newman and we hung out a lot. I was so shocked when I heard he had died. Good memories of those days!